Help! I’m running out of lame Pirate jokes and still have a superb recipe to share… Hope you won’t miss the lame jokes! Next time I’ll make some turtle for “Smoked Donatello soup” or something like that. But for now you’re here to read about the mighty Spiced Morgan Chicken Peg Legs. Even without the stupid jokes I promise you won’t get enough of them. Disclosure: "This post contains test products and affiliate links, which means that if you click on one of the product links, I'll get a small commision to keep this blog running. All opionions shared are my own." 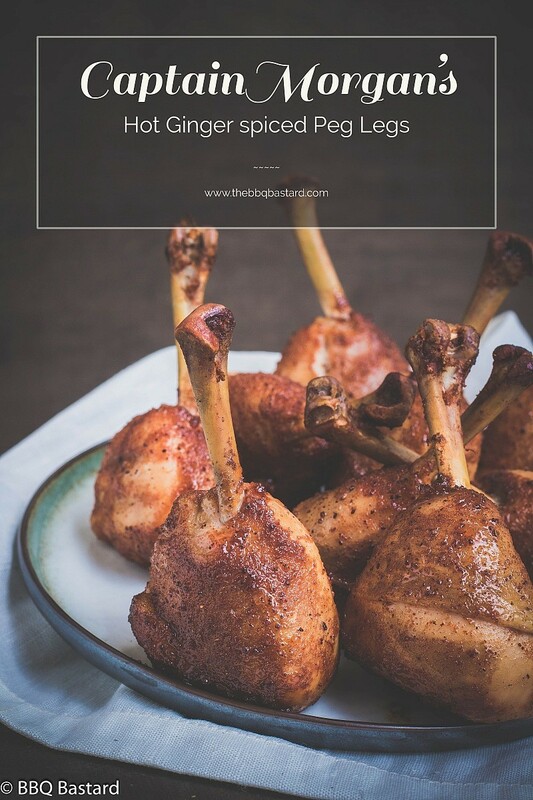 When I served these chicken Peg Legs to my family my wife’s first reaction was: “They are delicious but pretty hot! I think they won’t be kids proof.” Luckily there were the kids to prove her wrong. They kept asking for more and they didn’t even knew they were pirate related haha. But I guess it’s better that way… Otherwise I’d be left with bones only. I can remember me and my friends playing pirate games all the time. We would have fought many battles to conquer these. 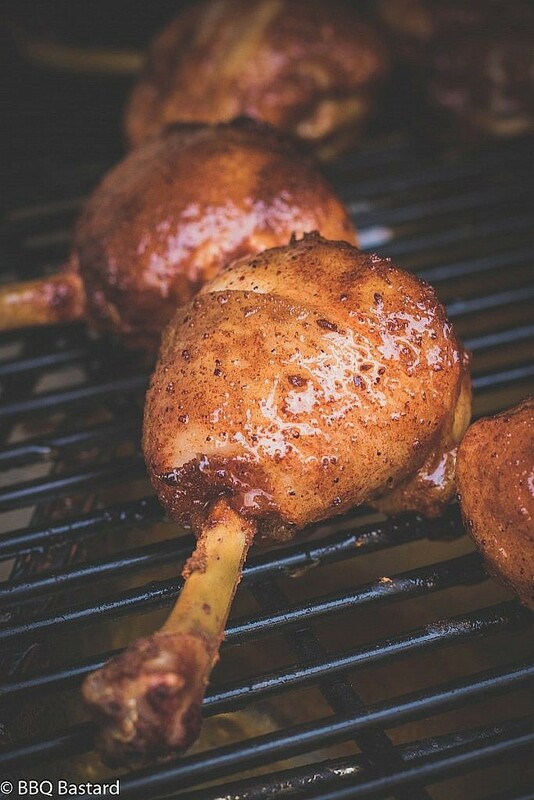 Chicken Peg Legs or Chicken Lollipops are prepared drumsticks. Like I explain over here in the “Sweet Cherry lollipops” recipe, there’s some work involved in the preparing process but it’s totally worth it. The result is simply stunning and most of all damned juicy. In comparison to the other lollipops I made I removed the knuckle cap. I thought they looked better with the knuckle cap on but a kind person attended me they tend to fall of while eating. Since we don’t want these chicken peg legs to end up in the sand I chose for safety. 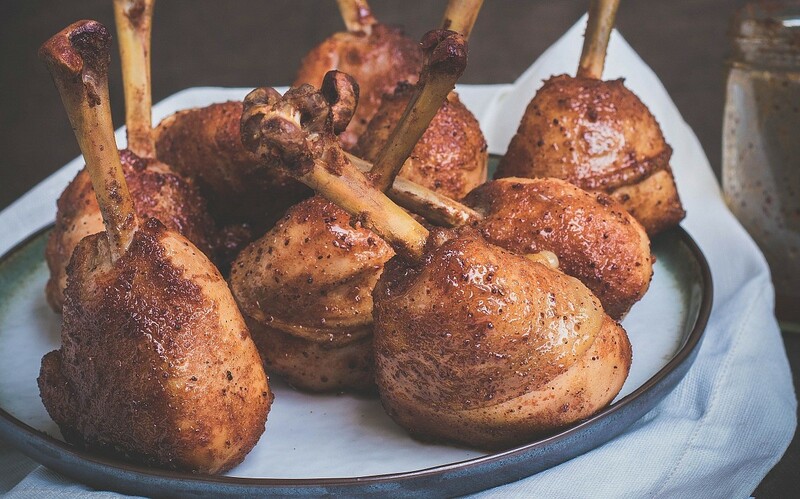 Another difference with the “Sweet cherry lollipops” is the sauce used to spice the drumsticks. Instead of using a thick viscous BBQ sauce with lot’s of sugar. I opted for a more liquid mop sauce packed full of flavors. The “Spiced Morgan mop sauce” I created is a rum based mop sauce with Asian and South-American notes. 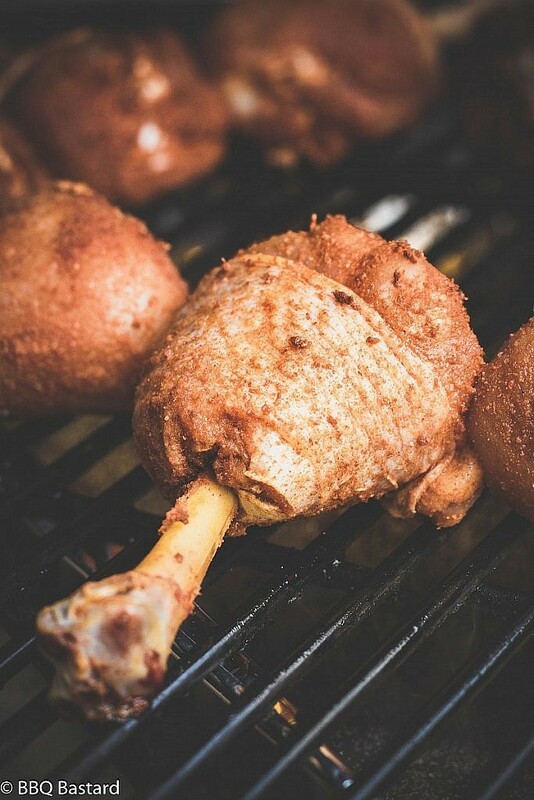 The “Hot ginger rub” I created for these Peg Legs also has it’s roots in both regions and combines well with the chicken and mop sauce. First you start by preparing the Peg legs like explained in the steps below and rub them with the hot ginger rub. Make sure you use a good sharp knife or you’ll end up frustrated. Put aside for an hour while making your mop sauce and starting the fire for indirect cooking. Toss in some rum soaked oakwood before you want to start cooking. Wait until the smoke turns slightly blue and put the hot ginger rubbed Chicken Peg Legs in the smoker. Mop them with the Spiced Morgan mop Sauce every 10 minutes for about 35 minutes until you get the right internal temperature. Thank you for sharing interest in the things I bring. I hope to hear your voice (or at least read what you would say) via social media and/or comments below. I tend to be happy with some extra promotion too. So if you’ve liked reading this post or liked the recipe I’d be happy to see some sharing love. 1. Take the drumsticks out of the fridge and make a cut around the bone right beside the knuckle. A sharp knife is useful in this part. 2. Push the meat aside to the thick end of the drumstick. 3. Slide the tip of your knife under the cartilage and lift the your knife while cutting the tendons. This way you can remove the cap. 4. Push the meat back and cut through the small bone and remaining tendons on the thicker part of the bone. Clear the rest of the bone so you end up with a nice Peg Leg. 5. Rub the Peg Legs "Hot Ginger Rub" and put aside for about an hour. 1. Mix all ingredients in a pan. Let simmer for a while. This way the flavors can combine and intensify. 1. Toss in two chunks of rum wood (or your favorite wood chunks) and wait until the smoke turns blue. 2. Once the smoke is blue put the Peg Legs in the BBQ, mop them with your Spiced Morgan Mop Sauce and close the lid for the next 35 minutes. Only open the lid every 10 minutes to quickly mop the Peg Legs. This way they'll get an awesome smokey flavor! Keep in mind that the more you open the lid the less smoke flavour you will end up with. “Affiliate Disclosure: My intent with this blog is sharing you some recipes as a source of inspiration you could access for free. Bringing this content however isn’t free. To cope with the costs I make use of affiliate links where I earn (in some cases) a small referral commision for the products you could buy. This support helps me running this blog. I guarantee no false statements will be made in this blog and only products I believe in will be linked. Hoping you understand this decision. Thank you! :). - There's an affiliate link on the knife. - The use of Captain Morgan rum is my own based on price/quality concerns. I do not get paid promoting there product! Feel free to use a different kind of rum.